The other Sunday I shopped for a diamond solitaire. Platinum, Tiffany-style band, at least a carat, perfect clarity and color. I looked into the heart of the stone through a tiny magnifying glass and saw it sparkling back up at me. Following painstaking research in the fancy jewelry boutiques of 5th Avenue – Cartier, Tiffanies, De Beers – Ronnie and I headed for the diamond district, an amazing strip of jewelry importers, wholesalers, manufacturers and dealers that runs between 5th and 6th on 47th Street. Some of the store fronts are jewelry shops where you can select from stunning modern pieces, or gorgeous antiques. 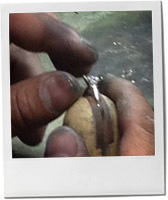 Others are divided up into counters like a very expensive flea market, and you can select a stone and a setting and have it turned into a ring before your very eyes. As well as this being incredibly interesting to watch, and giving you a custom made bauble, it’s staggeringly less expensive than buying from somewhere with a recognizable name on the box. “I’ll take the bigger one,” said Ronnie. And later that night, Karen said yes. 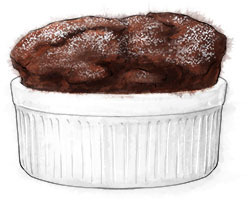 For those of us without diamonds to offer to our loved ones, chocolate soufflé will have to do. There’s a mythology about soufflé that they are difficult to make. I’m not really sure what the fuss is about – especially if you have some kind of electric beater for the egg whites. In an ideal world you’d whip the egg whites just before making the soufflé, but if you made them a little in advance and baked them off just before you want to eat them, well, what’s the worst that can happen? They won’t rise quite so triumphantly? You still have warm fluffy chocolate puddings. A few things: use room temperature eggs to get good stiff peaks. Wipe the mixing bowl with a cut lemon to make sure it’s spotlessly clean from grease which kills volume in egg whites. Don’t open the oven door or they’ll flop. This entry was posted in This Dinner Will Get You Laid and tagged chocolate, diamonds, engagement, souffle. Bookmark the permalink. While the souffle does sound decadent and delicious, I feel as if I am left holding the bag! After shopping for days with you up and down 5th Avenue, I do feel a photo of your hand, maybe in his, with the sparkler is in order, no? CONGRATS!!! Thank you. Congrats to me indeed for not stealing the ring off Ronnie, and for not allowing him to pick a ring that Karen would totally hate. It really was a stunner, though I totally felt the responsibility of being the ring adviser! Ahhhhh…duly noted!! Must have missed something in the post, most likely due to the Grapefruit Margs we concocted yesterday evening!